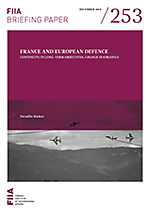 While the long-term ambition is the same, the French approach towards European defence has changed from being concerned with developing the defence structures within the EU (“Europe de la defence”) to becoming more concerned with the need to strengthen the European capacity to act. This Briefing Analysis addresses the following questions: What does this mean? What do France and Macron want to achieve? Does the approach represent a break or continuity with traditional French politics? And what kind of support does he need to succeed? This publication is part of a research project conducted by the Finnish Institute of International Affairs entitled “The EU as a Security Community: citizens’ views and values”. The project is part of the implementation of the Government Plan for Analysis, Assessment and Research for 2018. Pernille Rieker is Research Professor at the Norwegian Institute of International Affairs (NUPI).